"Networking" is what Janet has used herself for her Financial Planning business- itis simply connecting, and can be face to face or online. In this VIP Group Da,y she will share with you all the tips for success and make you aware of many mistakes that can be usually mademade. Attending a workshop or an event, is only the beginning - in order to be successful and confident with your business "networking" or client attraction and Growth ,you must have an action plan, be accountable, and also share with others, as you will then know that you are not alone and that like-minded people can always offer benefits to each other by sharing. This is the key to the NWJ High-performance Coaching Programmes and group workshops. Janet has developed many Connection and Growth modules and this day brings them together foryou..
Gain Influence in a Local Area? Be Known as the Go to Person in Your Field? Starting with the understanding that networking works in many ways, yet many business owners are uncomfortable with the idea of traditional Networking. "Networking with Confidence is perfect for those who are highly sensitive, introverted and feel frustrated, stuck, and overwhelmed when Networking." 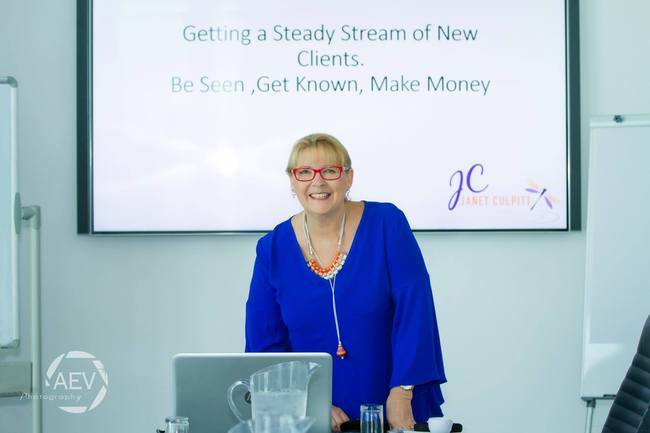 The end result is simple - Getting a Steady Stream of new clients in various ways, taking yourself to a higher level, understanding how relationships affect business growth. The signature "Networking with Confidence Workshop" is usually a half-day "How To" workshop concentrating on the basics of overcoming Fears, Starting and Adapting Conversations, understanding the different type of networking groups and the importance of Following Up. Further to that this 1-day event will give you much more detail hands-on strategies applicable to you . Relationships and Strategies - getting a steady stream of new clients and business and personal growth. Business Owners - achieving your work-life balance and how relationship handling matters. Is in alignment with your core values. Identifies language you feel comfortable using when talking to prospective clients. Identifies where you can meet your clients. Connects your networking to your marketing. A plan that you feel comfortable implementing. And, when implemented, you will feel confident because you know what to do.